Happy FriYay! I'm so excited for this weekend because we are headed to Cape Cod for a little family get away. We normally make it to the Cape every summer, however, last year we had to cancel our plans do to a little insect infestation. (If you have been following me, you may remember that the twins, somehow, managed to get head lice). Since we weren't able to get to the Cape last year, it makes our trip this year more exciting! Now about my look! I have been obsessed with peplum tops, but hadn't yet added one to my wardrobe because I could never find one that fits well. Being tall, and well endowed, they always fall too short, giving an awkward, crop top feel. However, when I saw this one from Zaful, I decided to give it a try, and I'm so happy that I did! I love the boxy fit, the length is perfect, and I'm obsessed with the color. It is also available green, white and burgundy (which would be perfect for the fall). 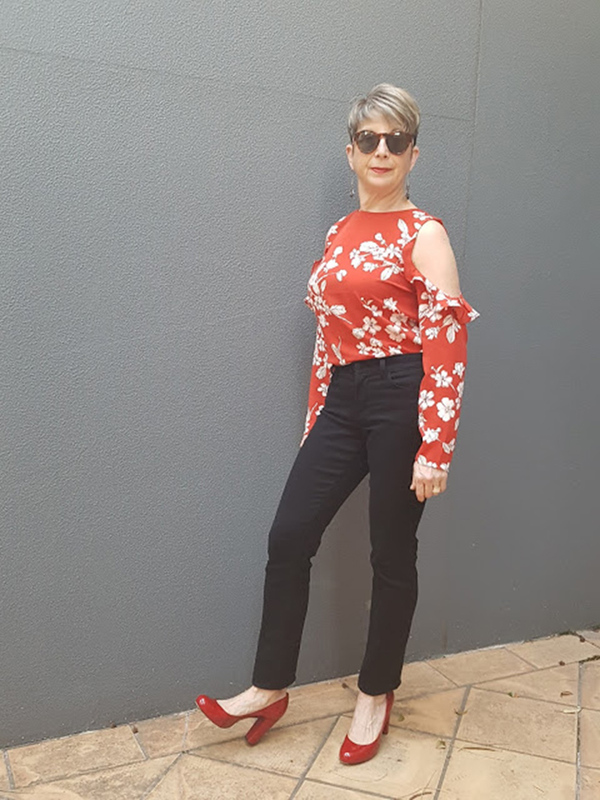 Although I have been wearing this peplum tee non-stop with denim shorts and sandals, I decided to show you an easy way to dress it up, making it perfect for grabbing drinks withe the girls (or a family dinner when you want to feel more put together). I paired it with a skinny jean to balance out the boxiness of the tee, then finished my look with a statement necklace and heels, which gave the tee a dressier feel. It's an easy, comfy, yet stylish look. The feature blogger is Anna of Looking Fabulous @ Fifty. You all know I'm a sucker for the cold shoulder, so I'm loving her floral top, and how she's rocking the trend. Make sure to visit by her blog and say hello! Loving the purple top, so chic! 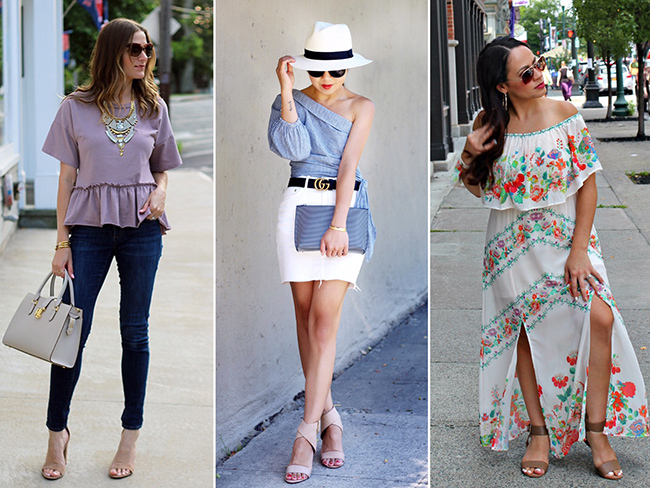 Your peplum top is the cutest! Love the color and your statement necklace is perfect with it! Love this peplum top! So cute on you. Have fun on your trip this weekend. I'm loving your peplum top, the colour looks great on you and that necklace is killer. Peplum tops are so great but I have yet to find a one that works for my body type. Hope you and your family have a great time in Cape Cod. Wow, Rachael! Such a gorgeous look. I love the peplum top and the color is beautiful. And that statement necklace is perfect! I really like the fit and shape of this peplum top and that color is gorgeous, too! I really like all of these full on statement necklaces I've been seeing lately, the one you have on is too cute! What a cute top and a great necklace. Love your whole look! Love the color and fit on this top! Peplums can be hard to find the right fit, but this is perfect! Ooooh, That statement piece is so hot. 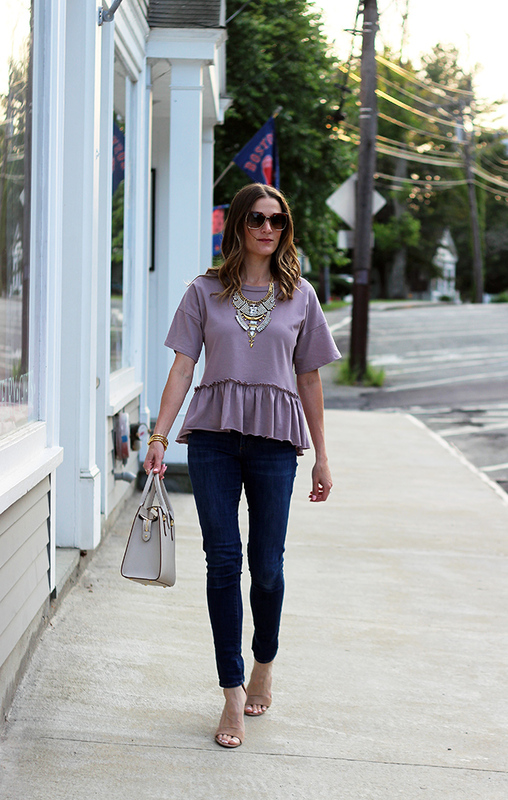 This purple peplum is perfectly styled with the oversize statement necklace! I usually think of peplum as a girly trend, but the necklace definitely gives it an edgier vibe. Have fun at the Cape! Have a great weekend with your family! The necklace looks fantastic on the top! What a elegant color! Love the peplum on that shirt, the color is very pretty too! What a lovely top you got there; I love how you pair it with that beautiful necklace. Really chic and edgy look. Lovely top, it looks fab with that statement necklace! What a great peplum top! Such a cute peplum top!! I've been wanting one like this! Love this pretty top! it looks so comfy and versatile.